Our morning rhythm is simple with very similar structure: creative free play, busy parents do an activity, like making our snack, chopping fruit, making bread and children float between playing and perhaps wanting to 'help' the adults. After tidy up time there is a time of coming together as a group singing songs and rhymes, after which we wash hands ready for snack; this is followed by outside time in the garden. We close the session with a goodbye circle and for the older children a story. The children soon get to know and enjoy the rhythm as a result of settling in and feeling safe and secure. If possible, please arrive on time. Your child will then respond well to the rhythm of the morning and you will not feel you are rushing to catch up. The mood is of reverence. Emphasis on quiet and calm. This gives peace and freedom to the child. Adults, please don't play with your children, allow them to explore and enter creative play by themselves. This is so beneficial for their intelligence and imagination. 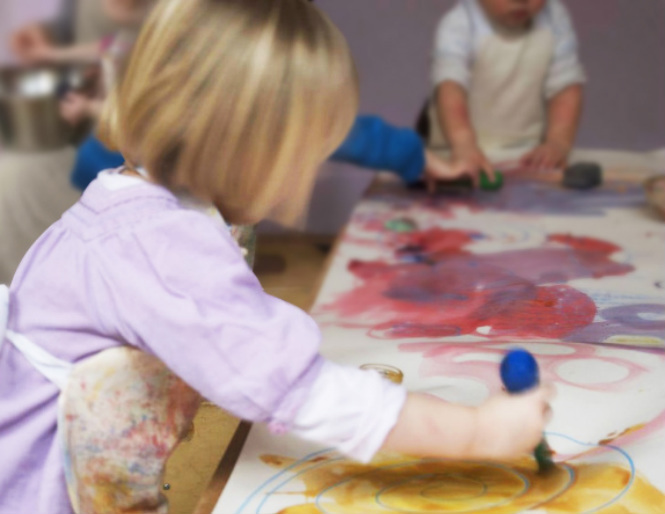 The adults are encouraged, once the children are settled in their free play, to join a craft or domestic activity. We explain that the adult at work, engaged and absorbed in an activity will free the child even more! Children a little older, will naturally want to not only watch but try to imitate the adults and help. The leader may choose not to have activities for the children; we work with imitation and play is the children 's way to express this. When the children arrive they change into their slippers and there is an hour of free play where they can explore the toys and found objects, which they use to represent so many imaginative things. There is also an activity around the table in which the parents and group leader will take part, and the children join in if they wish. As young children love to imitate, it is only necessary to perform the activity and only guide the children if they ask. When painting and drawing however, we try to leave the child to express their own will. As far as possible please avoid talking and explaining, drawing shapes and pictures for them. This allows the child to just be and just do for the sake of doing. We don't intellectualize anything at this stage of their development. We rather give the meaning through action; the children are able to pick up the essence of things. 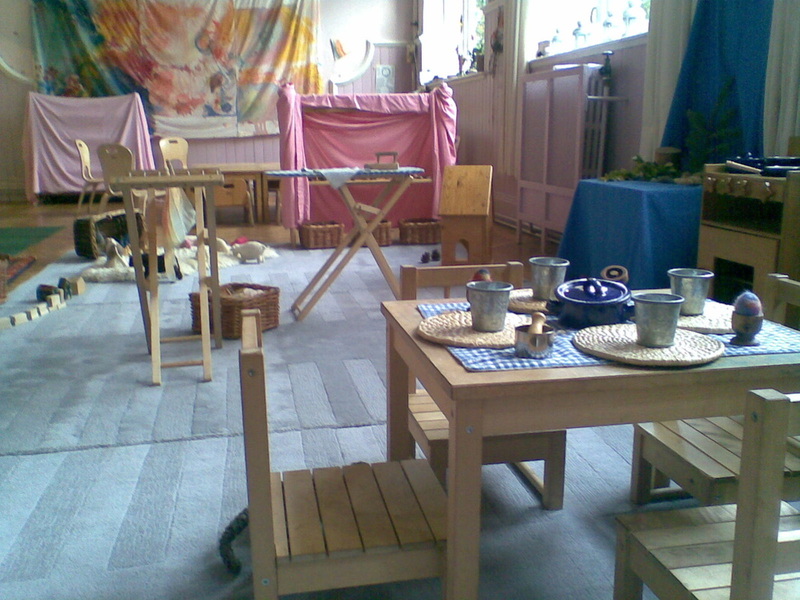 To transition away from play and activity time,together we sing “time to tidy away, time to tidy away, end of all our play, play another day” or “I met a little tidy mouse, he said let’s tidy up this house, tidy, tidy, tidy, here and there, tidy tidy everywhere.” As us parents/adults slowly tidy the room getting ready for our ring time, it’s amazing how the children respond to our singing, imitate and love to put things away – much more than if they are simply told to tidy. For them it’s a game and not a chore. It is most helpful if parents please take care to put things in the correct place, many families welcome the influence of this activity to instill good tidying habits at home as well. When the leader starts to sing “Who’ll come in to my small ring, my small ring, my small ring, Who’ll come in to my small ring, and make it a little bit bigger?” to the tune of “Here we go round the mulberry bush” children eagerly join hands for our Ring time. Here is a moment of “breathing in” where you can encourage your child to be with us in the circle. To close ring time we sing “This is the way we wash our hands”, children respond by running over to the bowls of soapy water. Please remember to roll up your child’s sleeves as children love to plunge their little hands in the warm water! We try to go out whatever the weather unless it’s absolutely pouring. Children move their limbs differently outside and love to dig, play with water, jump and move about freely. You can make sure that your child wears appropriate clothing so that he or she will not get cold or wet. this is something your leader will constantly be striving for. As mentioned before, imitation is such a powerful motivator, what one parent allows their children to do, can be quickly copied by the rest of the group. The second stage of this is the children believing this impolite behaviour is part of the structured rhythm, and so recalls and repeats it the following week. running, hitting, jumping on to furniture/table at any time during the session. Bringing your own toys; please try not to, simply creates sharing issues...also they often get forgotten! The leaders think it is best to dampen this behaviour, before it gets to this stage as it becomes harder to stamp out later. Please use a quieter voice than normal whilst attending. With so many children, and so many chatting mums, the noise can escalate quickly. This rising level of sound carries a chaotic feel, and as the noise increases many children show distress and start shouting as well. By harnessing the power of imitation, if parents can try to keep their voices down, the children will follow. Please do not text or ring or take snaps with mobile phones inside the session. If you need to make a phone call, please do so in the lobby so as not to disturb others. We try to encourage parents to come and enjoy the session and be as stress free as possible; this also means to be relaxed about their children getting wet, sandy or dirty. To avoid this, please dear parents come prepared, warm layers and full waterproofs for outside time and for indoor...spare clothes. The children do need to experience being part of the group fully, involving getting mucky and experiencing all different weathers, using all their senses to explore and learn; this is their 'play'. The group uses candles to teach reverence. This carries some risks and we ask all parents and carers to pay special attention when we are interacting with the candle flame.Leaders will not use open flame but simple tea lights in lanterns, always ensuring they are in the safest place in the room. The fire assembly point is in the rear garden by the shed. The fire doors require a good hard shove and they release in the case of a fire. We are linked with Greenwich Steiner School, a school that welcomes children of all cultural, racial, social and religious backgrounds; the school provides an education imbued with a fundamental respect for the individuality of each human being.